The U.S. Army, in collaboration with the U.S. Air Force, is developing the concept of Multi-Domain Battle to better coordinate air and ground forces to meet shared challenges. Multi-Domain Battle is intended to wrest the advantage from potential adversaries and restore a credible conventional deterrent and warfighting capability against peer competitors. This is not the first time that the Army and the Air Force have sought closer collaboration: In the 1980s, the 31 Initiatives and the AirLand Battle doctrine were similarly focused on closer Army and Air Force cooperation to counter a perceived overmatch in Warsaw Pact capabilities. There are lessons to be learned from how these efforts proceeded and why they did not continue. To be successful, Multi-Domain Battle will have to address the fundamental questions of each service's culture and deeply held views about warfighting. Convergence is necessary but not sufficient. Understanding the positive lessons from the formation of the 31 Initiatives during the 1970s and 1980s — as well as why AirLand Battle ultimately caused a divergence between the Army and the Air Force, rather than a convergence — is an important place to start. Ultimately, the key lesson of the 31 Initiatives for Multi-Domain Battle is this: When the Army and the Air Force work closely to solve a shared problem — and derive mutually agreed-upon solutions — much can be accomplished. This Perspective was conducted jointly within RAND Arroyo Center and RAND Project AIR FORCE. 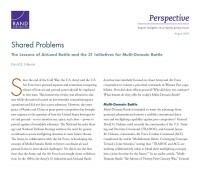 This report is part of the RAND Corporation perspective series. RAND perspectives present informed perspective on a timely topic that address the challenges facing the public and private sectors. All RAND perspectives undergo rigorous peer review to ensure high standards for research quality and objectivity. Johnson, David E., Shared Problems: The Lessons of AirLand Battle and the 31 Initiatives for Multi-Domain Battle. Santa Monica, CA: RAND Corporation, 2018. https://www.rand.org/pubs/perspectives/PE301.html.